Have you ever considered becoming a military PT, but have no idea where to start? 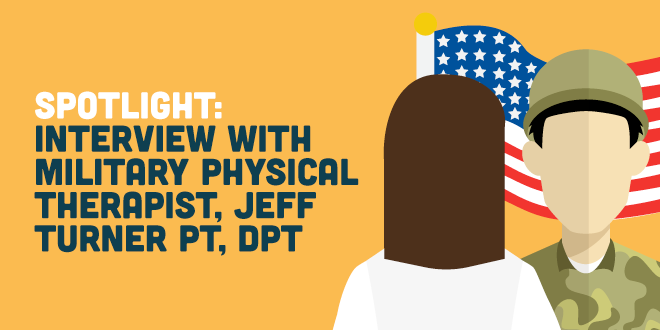 We sat down with military physical therapist, Jeff Turner, PT, DPT to get an inside look at the life of a military PT. Read on to learn the ins and outs of practicing physical therapy in the military. What is your full name, title, and year you graduated (and from what school)? My name is Jeffrey A. Turner and I'm an active-duty officer and physical therapist in the U.S. Air Force. I am the Deputy Flight Commander of Physical Therapy at Peterson Air Force Base, Colorado. I graduated from Arcadia University in Philadelphia, PA in January 2016 with my Doctor of Physical Therapy degree. Why did you pick your particular school? There were several reasons which lead me to my decision of attending Arcadia University for DPT school. Firstly, I knew I wanted to go to a school that had a strong faculty grounded in both the clinical and research realms of both neurological and orthopedic fields. Arcadia University had this, and I was very intrigued by the research that was being done by professors like Dr. Rebecca Craik (previous Editor-in-Chief of the Physical Therapy Journal) and Dr. Philip McClure (internationally renowned shoulder researcher). Secondly, Arcadia University had a unique curriculum format which is hard to fully represent, but the basic premise is that each semester was broken into five 3-week units. Each unit consisted of all normally included classes (patho, anatomy, pharm, biomechanics, etc.) geared around one specific case study (e.g. 65 yo w/ L-sided hemiplegia and acute L shoulder atraumatic instability/dislocation) with a final exam at the end of each 3-week unit. Did you know beforehand that you wanted to be a military PT, or did you decide during/after school? I had an inkling before DPT school that I'd probably pursue a career as a military PT, mostly secondary to early exposure from my father serving in the US Marine Corps. That inkling quickly blossomed into a full-fledged desire to be a military PT during my first year at Arcadia University. To state it shortly, my primary reasons for pursuing the military were my desire to practice clinically at the highest level that my education allowed (i.e. established as the neuro-musculoskeletal expert, ordering imaging, prescribing medications, etc. ), the ability to travel the country and the world, and the honor to serve my country and rehabilitate those men and women that keep us safe. What does being a military PT have to offer that civilian PT doesn't? Unrestricted direct access, no fighting with insurance regarding medical coverage, 100% authority to appropriately prescribe physical therapy interventions (no requirement to bring all patients in for 2-3 visits per week x 4-6 weeks and vice versa if needed), advanced training and ability to order investigative tests (imaging, labs, etc. ), advanced training and ability to perform other medical procedures (corticosteroid injections, joint aspirations, battlefield acupuncture, dry needling, medication prescription, durable medical equipment prescription, etc. ), and advanced training and ability to prescribe military duty/work and profile restrictions. 0645-0730 -- Flight Physical Training: I'll spend this time weight lifting, occasionally we will have a team activity day and play wally-ball. 0745-0930 -- Administrative Duties: provider meetings, providing assistant/technician feedback, following up on imaging and referrals I ordered from the previous day. 0930-1230 -- Patient Care: 3 evaluations and 3 re-evaluations. 1230-1300 -- Lunch: eat, PT staff meeting/huddle, debrief complex patient cases with assistants, and finish notes. 1600-1630 -- Catch up on notes as needed, debrief patient cases with assistants. 0630-0700 -- Flight Physical Training: individual training. 0700-0830 -- Sports Medicine Outreach: perform movement screens, weight lifting movement assessments, advice on mobility and recovery exercises, and briefs on injury prevention topics. I'm currently leading the medical team that works with our base's EOD (Explosive Ordinance Disposal) Team. 0830-0930 -- Administrative Duties: provider meetings, providing assistant/technician feedback, following up on imaging and referrals I ordered from the previous day. 1300-1500 -- Patient Care: 2 evaluations and 2 re-evaluations. 1500-1630 -- Military Duties: medical staff meetings, PT clinic business-related meetings, triage team training, miscellaneous other duties. What is your normal caseload like in terms of diagnoses? I see an average of 11-12 patients per day, including 6 new evaluations and 6 follow up appointments. I'd say the diagnoses, in general, are pretty similar to a sports outpatient physical therapy clinic. The average age of patients is around 26-28 years old and they are predominately male. I'd estimate that 20-30% of our cases are post-operative knee, ankle, and shoulder surgeries; 30% low back and neck pain; 30% shoulder and lower extremity overuse and training load error related injuries; and about 10% complex injuries or non-musculoskeletal conditions that need further investigation. How much is manual therapy vs exercise vs education? Military physical therapy demands simple, effective, and efficient medical care at a minimum. My evaluation emphasizes ruling out sinister stuff, re-assuring and educating, and promoting self-care and independence. A visit with me usually consists of 60% education/advice/re-assurance/strategic health planning, 30% exercise demonstration/prescription, and 10% manual therapy. How many patients per day do you see? 11-12 patients per day. 50% new evaluations and 50% follow-ups. What is documentation like in the military? The overall documentation system is a bit outdated, but it is simple. You pretty much make your own templates for patients using a Word Doc. I definitely spend much less time filling out military notes than I did when I was a civilian physical therapist. How is the pay/career advancement? Starting salary can easily be found on military.com based on rank and years of service. As physical therapists with a doctorate, you will enter the military as an O-3, which is a Captain or Lieutenant in the Navy. I can tell you personally that the starting salary is very good compared to other entry level positions, plus there are a number of benefits, including tax-free monthly housing and food stipend, access to tax-free shopping on military bases, free medical/dental/vision care, access to one of the best pension and investment savings plans (TSP), and a number of other free or reduced expense family and individual benefits. Are there any loan repayment options through the military? Attend US Army Baylor University DPT for free tuition and a salary. Attend civilian DPT school and apply to Direct Commission into the military. Secondly, apply to the Health Professions Loan Repayment Program (HPLRP) - at this time US Air Force is $80,000 over 2 years with a 25% tax (subject to change secondary to supply/demand and congressional approval). There are plenty of opportunities for mentorship in the military including, advanced training courses annually, first-year sponsorship programs, mandatory online or in-person orthopedic residency (OCS), and sports residency (SCS) at West Point. There are further opportunities to obtain certifications, including fellowships in tactical sports physical therapy at the US Air Force Academy and orthopedic manual physical therapy (FAAOMPT), Doctor of Science (DSc) programs, and PhD programs. The resources are there, you just need to seek them out. Is there a minimum commitment to be in the military? 3-4 years active-duty and 4 years reserve for the US Air Force if you direct commission. Do you have to move around a lot, or live in certain places? A 3-4 year length of stay is required if you are stationed in the United States; a 1-2 year length of stay is required if you are stationed abroad. Every year you have the potential opportunity to deploy for 6-8 months or go on a humanitarian relief mission for 1-2 months. Additionally, there are many opportunities to go on temporary duty assignments to other bases for continuing education, residency, fellowship, and/or doctoral training (DSc and PhD). Bringing the Evidence to OT Practice: You Can Do It!